Eclipses the normal Windows game　with 3200x800 pixelsfor ultra widescreen shooting! Let loose a series of chained chained explosions on this massive screen, the likes of which have never been seen before! Completely fill a long 2000 pixel ultra-charge-shot gauge to unleash a massive explosion 2000 pixels wide! It blows away all standards and crushes the competition! 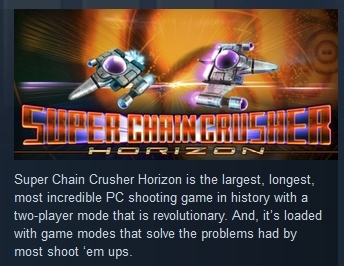 Introducing Super Chain Crusher Horizon!